st-20033 Features: -Interior cell phone pouch, pocket pouch and a zipper pocket.-Zipper opening entrance.-Rear zipper pocket.-Front pouch pocket.-Embossed gold RIONI Moda Italia emblem.-Goldenrod fabric RIONI monogram print lining.-Throw all your goodies inside. Includes: -Also included is a detachable zipper pouch wallet. 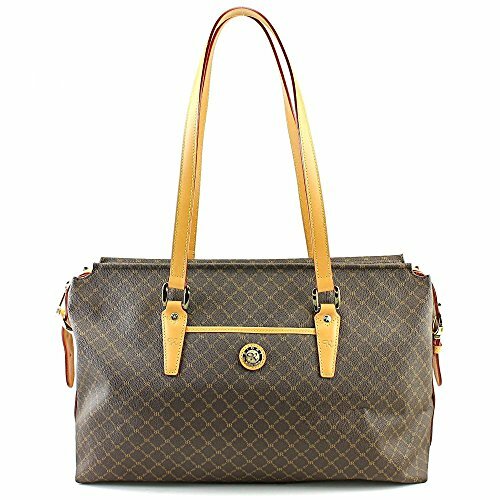 Color/Finish: -A gentle dark gold ''RR'' Rioni monogram print on solid brown Italian canvas body accented with Italian dual-strapped leather handles and trim. Dimensions: -Dimensions: 11'' H x 17'' W x 6'' D.
If you have any questions about this product by Rioni, contact us by completing and submitting the form below. If you are looking for a specif part number, please include it with your message.